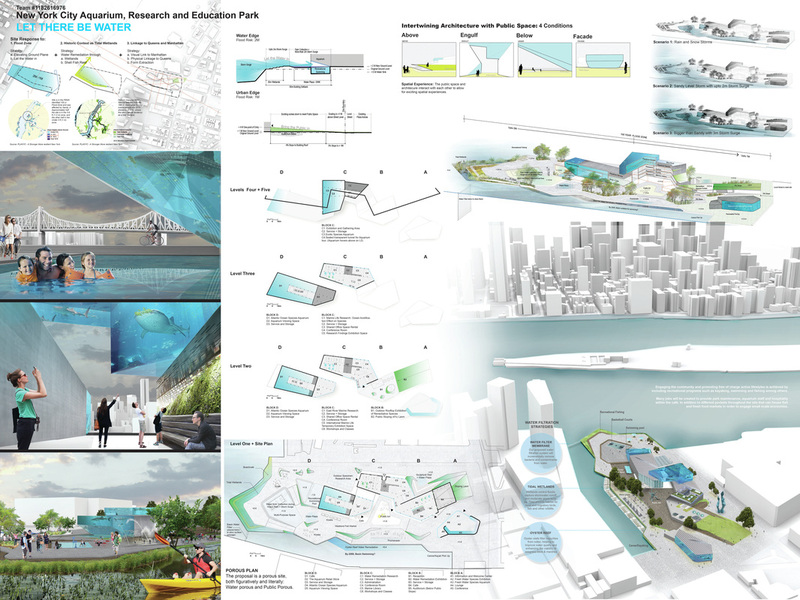 The idea behind this proposal for the NYC Aquarium and Public waterfront is one that looks beyond the normative path for an aquarium, and focuses on experiences of water, scale, and light. As a visitor you embark on a continuous journey through canyons of copper skylights, vast ocean views, and deep, long viewing spaces to feel the sheer scale of the ocean and the fish that inhabit it. 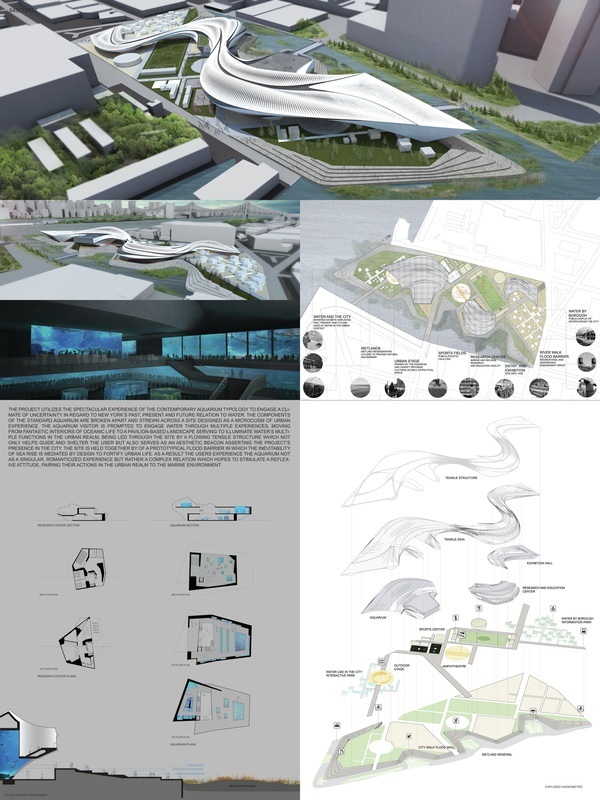 The Aquarium engages the surrounding context by embracing those who inhabit it, and bringing them away from the building itself, and into the experiences that lie within. Long Island City was once home to 5 POINTS, "The Mecca of the Graffiti." This facility was razed for high-rise development - Its stored artistic memory forever lost. Drawing inspiration from 5-POINTZ' graffiti culture, the Aquarium and Graffiti media attempt to capture movement and life. The project's "canvases" for "graffiti," and its changing murals, create aand sustain memory, by replenishment of impermanent images. Murals elicit visitors' memory, along the path that they choose to follow. Terrazzo material makes countless combinations of shapes and colors, or natural graphics that link the aquarium visibly with the historical graffiti and industrial identity of L.I.C. 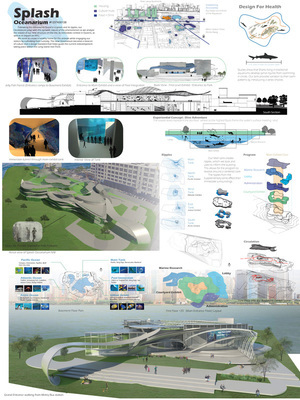 The Observarium is a public attraction that reinvents the concept of a city aquarium. Conceived as an enormous wheel rolling over an ice sheet, the site becomes a layer of cracked ice forming a public park, a dramatic space from which marine life can be observed from above. 'Bubbles' trapped below the ice form an underwater visitor gallery accessible from the ramp carved out by the wheel. The wheel itself contains a complete ocean ecosystem accessed by rotating capsules recessed into the skin of the wheel structure. 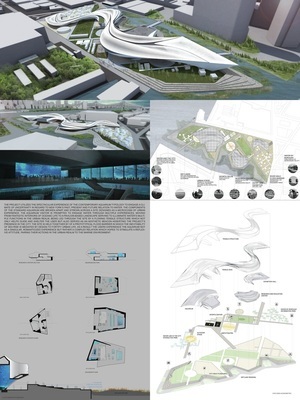 Leisure and educational elements are located on the Sky Park of the Observarium. Just inland of the projected flood risk zone the buildings are integrated with the Park and surrounding community, small footprints allow movement throughout the entire site. Diverse exhibition areas are established for experiential transformations, new understanding, and respect. 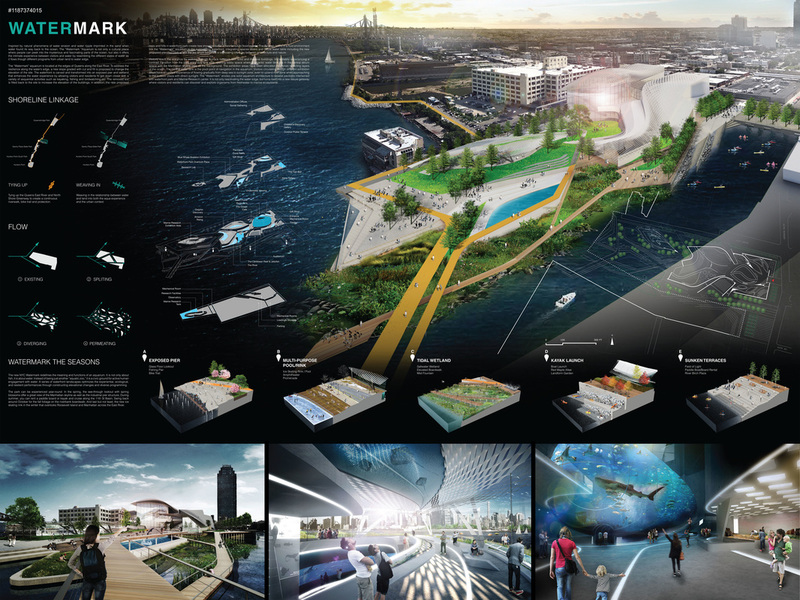 Interactive models of actual streams, rivers, and oceanfront with water infill controls and structural elements allow participation with the challenges of “controlling” rising waters. An interactive theater with real world information, experience simulations of potential future flooding and climate change. The Research Center will focus on sustainable marine practices with community access to education programs, library, and lectures. 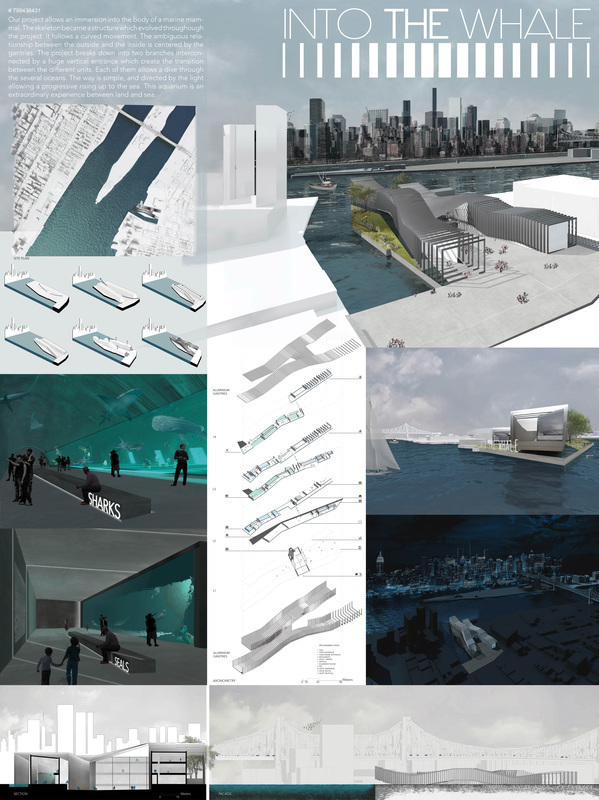 Given that the site falls in the FEMA flood zone, and was affected by Hurricane Sandy, our proposal approaches the site from the lens of water, with the notion of ‘letting the water in’, while aiming to ‘bring the public in’, connecting water to people through public space. 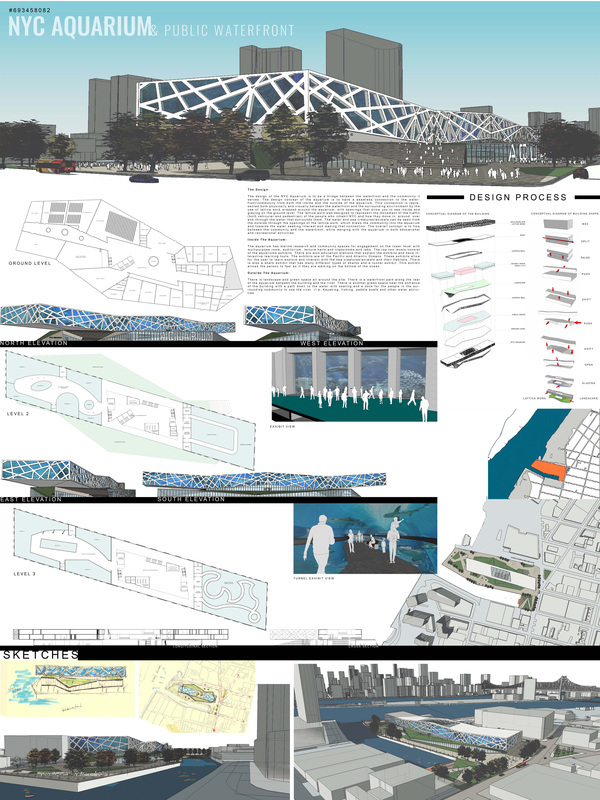 The design intertwines the architecture and its programs with public spaces that provide social and environmental benefits to the community. 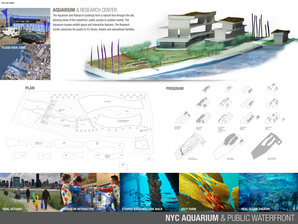 The design of the NYC Aquarium is to have a seamless connection to the waterfront & community from the inside and the outside of the aquarium. 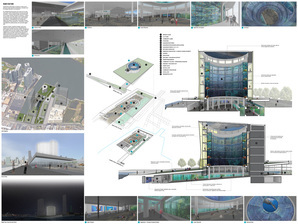 This is represented physically and visually by the use of lattice work wrapped around the aquarium, with openings that allow you to see inside. 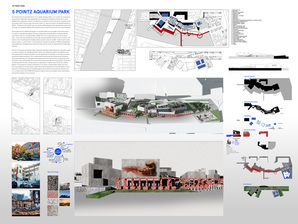 This draws the community into the aquarium and towards the water seeking interest and making that connection. The lattice work was designed to represent the movement of the people who inhabit NYC and how they move in, around, over and through the water that surrounds them. NYCEA puts emphasis on the issue of pollution in the Hudson river and aim to give New Yorkers awareness of flora and fauna of their estuary. Inspired by natural phenomena of water erosion and water ripple imprinted in the sand when water found its way back to the ocean, the “Watermark “Aquarium is not only a cultural place where people can peek into the mysterious and fascinating parts of the ocean, but also it offers the intimate experience between visitors and water by resembling the different states of water as it flows though different programs from urban land to water edge. 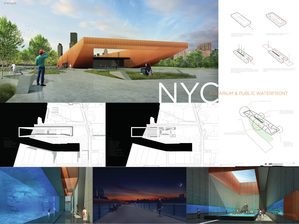 The proposal for the New York City Aquarium rejects to adopt any architectural ‘styles’ simply because a ‘style’ itself can no longer sustain a high level of attractiveness to the general public. What attracts the public is the content happening in and on the site. 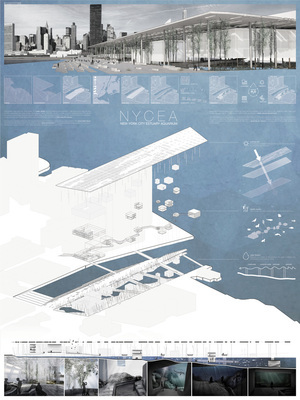 The proposal simply utilizes cut and fill technique, deliberately shapes the building volume in response to the programs need and site context. 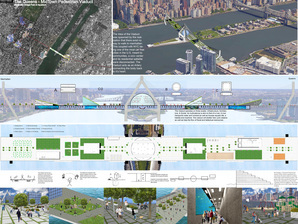 Key elements include a green belt 12 that divides internal spaces into sectors; a loop path 9 that extends beyond the site and touches down to the East River and a marine inspired skylight system 14 that implements throughout the building. Our project allows an immersion into the body of a marine mammal. 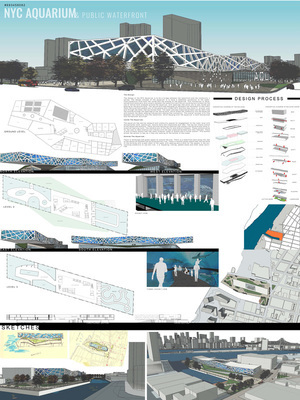 The skeleton became a structure which evolved throughout the project. 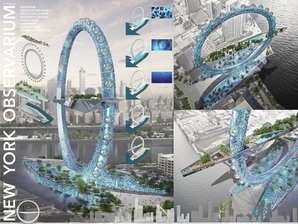 It follows a curved movement. The ambiguous relationship between the outside and the inside is centered by the gantries. The project breaks down into two branches interconnected by a huge verticale entrance which create the transition between the different units. Each of them allows a dive through the several oceans. The way is simple, and directed by the light allowing a progressive rising up to the sea. 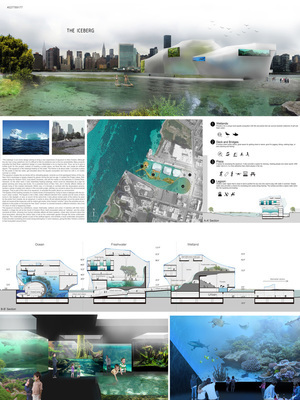 This aquarium is an extraordinary experience between land and sea. The project utilizes the spectacular experience of the contemporary aquarium typology to engage a climate of uncertainty in regard to New York’s past, present and future relation to water. 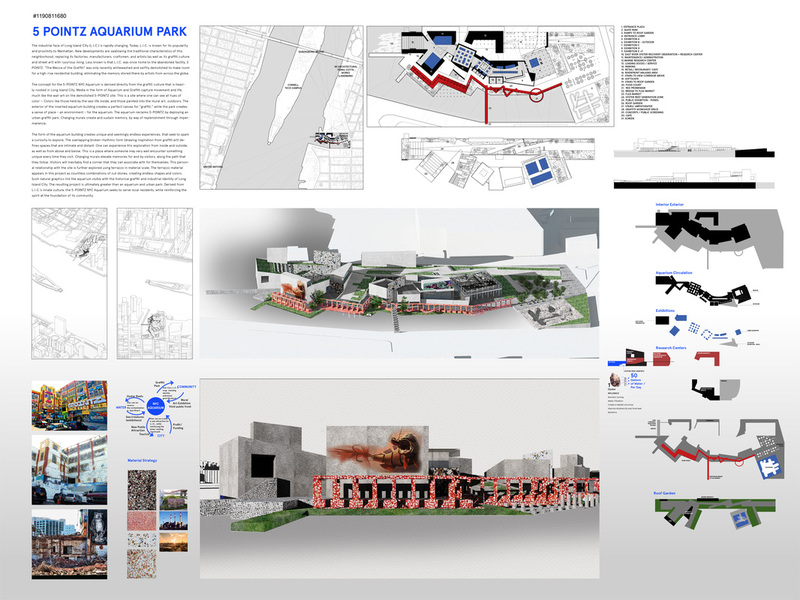 The components of the standard aquarium are broken apart and strewn across a site designed as a microcosm of urban experience. 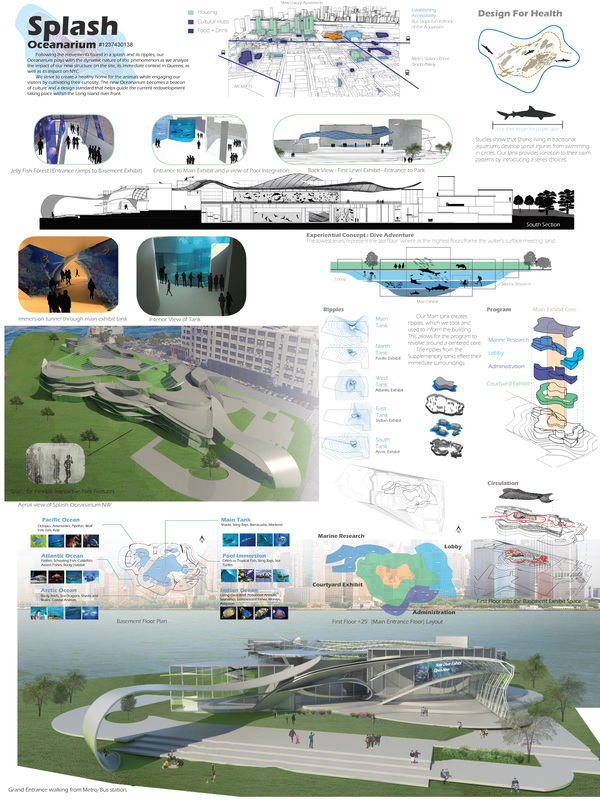 The aquarium visitor is prompted to engage water through multiple experiences, moving from fantastic interiors of oceanic life to a pavilion-based landscape serving to illuminate water’s multiple functions in the urban realm, being led through the site by a flowing tensile structure which not only helps guide and shelter the user but also serves as an aesthetic beacon asserting the project’s presence in the city. Even the street’s organization is on the cards, the relation with the sea is side-lining. The matter here is to sink into the sea to get it. 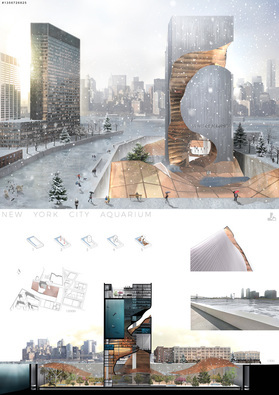 The sheet of glass like a groundwater or Coral sea refer to ocean world has been eating in Big apple’s building. Inside, we are like in the reef. Topics are empty, immersion and diving. All is about sea experience. 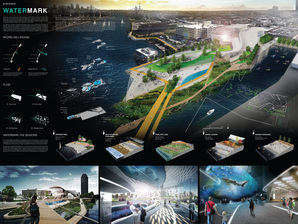 More than a new project, here a new shape of Coney Island is expressed, a contemporary vision of Luna Park, to encourage the dream of residents and tourists. Experiential relationships of aquarium visitors to the physical context seed our site planning, circulation and key design elements. Exhibits are immersive.Circulation is fluid. Visitor experiences vacillate between the solitary intimacy and breathtaking magnitude of sea life. 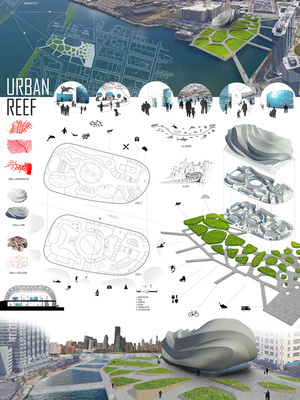 Gestures of urban connections knit the aquarium and it’s educational and public spaces into the community context. Recognizing the viability matrix for such a project, sites are suggested for a community boathouse, hotel complex, magnet school and other mixed-use development. 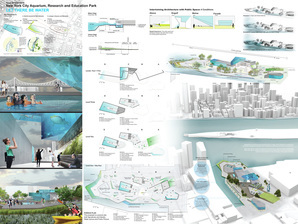 A sloping community lawn opens prime waterfront access to the public and simultaneously establishes the luminous aquarium rotunda as the beacon for LIC. 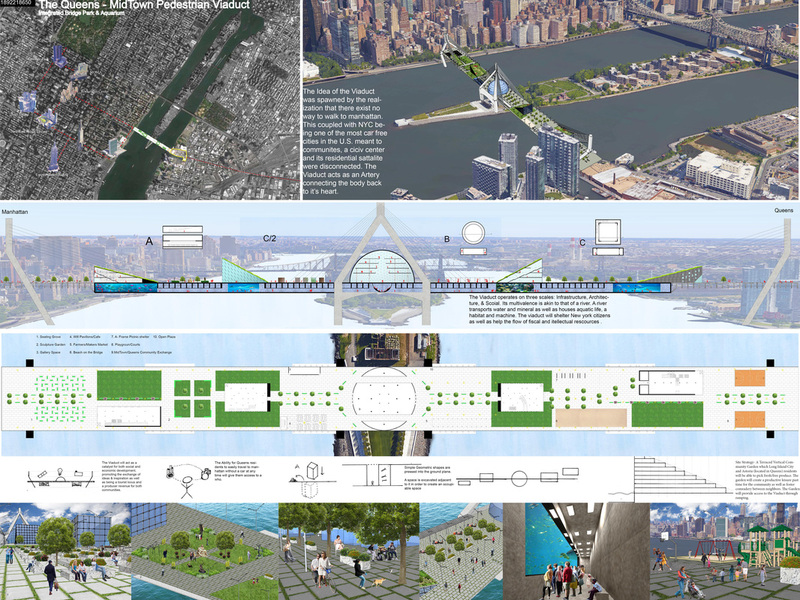 The Queens Manhattan Viaduct is about ease of access to opportunity and existing infrastructure for a community which is often second in mind to its better known partner Manhattan. New York being recognized as a global city should manifest its title through an unobtrusive work of public monumental architecture which does not occupy the city but gives back to it. The Viaduct is a vein which enables greater flow and efficiency of the cities life blood, it’s citizens, and all of its other resources thus making the body of the city more efficient. The Viaduct operates on various scales in order to mediate between several systems in order to create a greater unified whole. A coral reef is a bustling underwater city bursting with color and life, filled with vast diversity of structure, form, and pattern. 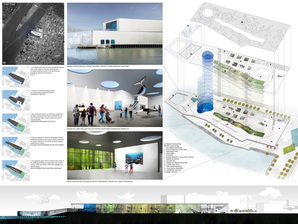 Reflected in the aquarium and park design, coral is in the form, site plan, and circulation. Pocket parks gradate from industrial to natural, public to private. As an institution of knowledge and discovery, the aquarium is a portal through which visitors leave the hustle and bustle of city life and dive into the marine world. It is the embodiment of the infrastructure of a coral reef, gathering the community to visit, interact, and learn about the natural world. Culture spills across Queens. 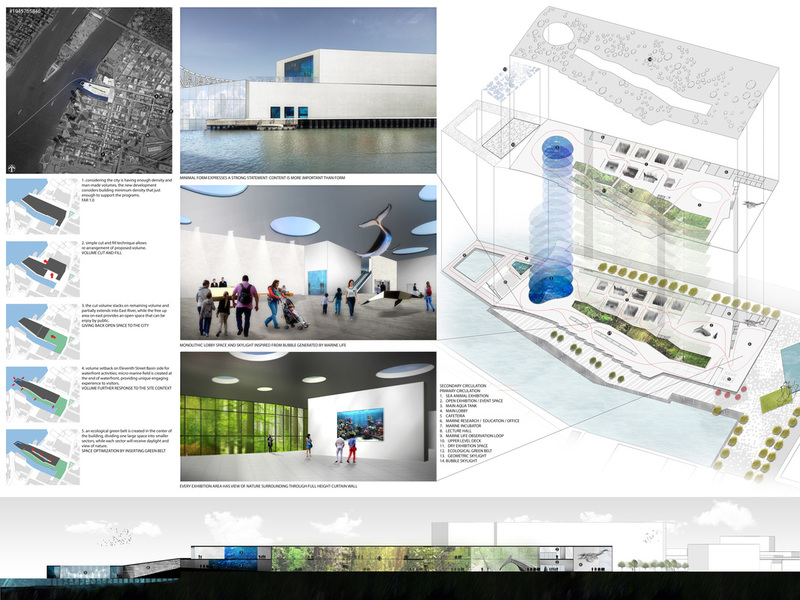 Within its neighborhoods and surrounding borrows, Long Island society streams into a new vessel, Splash Oceanarium. 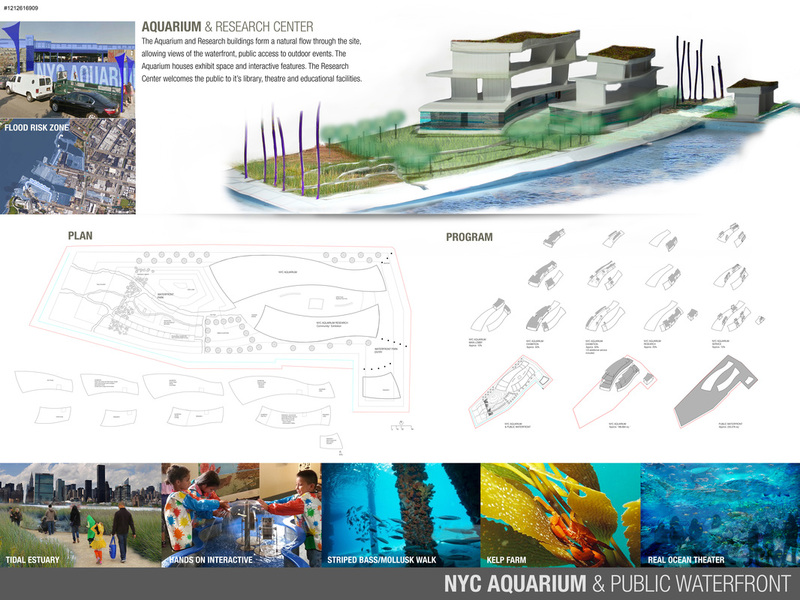 Reinvigorating both the local community and tourist, the building evolves beyond the traditional aquarium by cultivating education, health, and play. With our dynamic design, unique experience, and the surrounding landscape we have provided a node to escape and allow wonder to roam unrestricted. Diving into our development, visitors will flee the banality of Manhattan skyscrapers and discover the curiosity of our existence: nature. 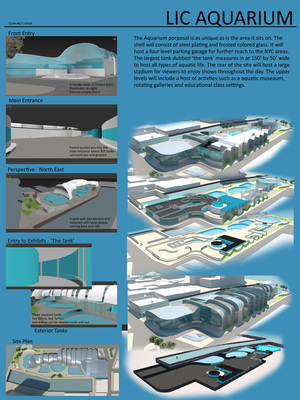 Our aquarium establishes a design standard for future development that elevates public interaction open to everyone.